We had a lovely weekend, apart from the weather, obviously. As I write Storm Imogen is still raging outside and if it carries on much longer I might be raging too! Much of Sunday was spent pondering the prospect of an empty nest. Owing to the wide age range of our sons (the eldest is 11 years older than the youngest), it feels like we’ve been raising children for longer than everyone else. I have friends who no longer have any children at home and some whose youngest child is only just starting secondary school. Most of my emptynester (is that even a word?) friends still see a lot of their children (some of them have boomeranged back from time to time) but life has inevitably changed for them. I’m in no hurry to reach the same stage but we’ll be there before we know it and I’m not at all sure how I feel about it. The reason for musing on all this is that at 7 o’clock on Sunday morning my husband took our youngest son to the station to join his fellow French A-level students and their teacher who have all gone to Bordeaux for this half-term week. The students will spend the mornings in classes at the Alliance Française and the afternoons doing sightseeing and various interesting activities. They will have homework to do too. They’re all staying with families, most of them in pairs, but my son was pleased to find that he’d be on his own because he felt it would force him to speak French more. It will no doubt help that his host family has teenage children. He’s been on trips before but as far as I can remember, this will be the first time it’s been just the two of us (three if you count Granny in her flat downstairs) for a whole week. Son texted (in French, bien sûr) to say he’d arrived safely and that the family is “très gentille”. He has an ensuite shower and wifi access. Not bad. I’m not sure why but lasagne seems like the perfect dish for a Saturday night supper. I made one this weekend, fitting the various stages in between other tasks and watching the Six Nations rugby. The recipe, by Tamasin Day-Lewis but based on Marcella Hazan’s version, is one I use all the time. As Tamasin says, a good ragù should have a mellow and gentle flavour, which is why you add milk. And don’t even think of using lean mince: you need fat to make a good, sweet ragù. I’ve been using this recipe since before I got my Aga, but it’s perfect for Aga cooking because it can be left for hours and hours in the simmering oven. t’s great with tagliatelle or spaghetti but on Saturday I went the whole way and made lasagne al forno. Return to the simmering plate and add the tomato purée, bay leaves and milk and simmer gently for about 10 minutes, until the meat has absorbed the milk. Sitting down to eat this with a green salad and a glass of red was a lovely way to end a day which got off to a bad start; we discovered our shower was leaking into the living room below. Thankfully my husband is handy and managed to fix it. While he did that, as well as making my ragù I had another go at making the ginger cake that went so badly wrong last time: it was better this time but the batter rose over the edges of the tin. [Insert expletive here] Next time, I’ll use a bigger tin and if it works, will let you have the recipe because it does taste good. Italian friends came over to watch the Italy v France Six Nations match with us. Because C is a marvellous cook, it was with some trepidation that I served them the cake but they pronounced it delicious. Phew! They then left us to watch England v Scotland without them. Well done England! So, Sunday felt rather strange. We had a Sunday roast as usual and I’m sure we’ll continue with that tradition, at least for as long as my mother-in-law is with us, but I wonder what we’ll do after that. Will we lead a more fancy-free life with no fixed meal times? I just don’t know. I cooked slow-roast shoulder of lamb (the butcher was happy to cut a shoulder in half for me: a whole shoulder would have been far too big) but I’m not going to write about it here because it was a very similar recipe to the one I posted on my tumblr here almost exactly a year ago. Incidentally, it’s Shrove Tuesday tomorrow and I will be making pancake cannelloni with the leftover ragù: just make crêpes, roll them up with ragù inside, lay them side by side in a dish and pour béchamel over the top, finishing with some grated Parmesan. Bake in a hot oven. We finished our Christmas cake a few days ago and since we’re not doing a clean/dry/healthy January or whatever it is we’re supposed to do, I decided to bake a cake yesterday, the first baking I’ve done since before the festive season. When I asked my youngest what he’d like, he didn’t hesitate: the ginger cake from the Nordic Bakery Cookbook, a gift to me from his big brother. I’m half Norwegian, which makes the boys a quarter Norwegian, and we all love the recipes in this book. Actually, our youngest has baked more from it than I have, and very successfully. Since I last made the ginger cake (in an 8″ tin), I’ve bought the correct sized (7″) tin, which is the one I used yesterday. I knew the cake would therefore be deeper and I’d need to make sure it was cooked in the middle. At the end of the allotted time, the skewer came out clean, so I knew it was cooked through, but as you can see in the photos, I was WRONG. As I turned it over the middle began to ooze out, creating, to much wailing by me, a massive sink hole. How could this be? One explanation is that I inserted the skewer at an angle and somehow missed the middle, but I don’t really believe this. Nor do I think it has anything to do with the timing adjustments one has to make for Aga cooking because I’ve got used to that now and nothing like this has happened before. 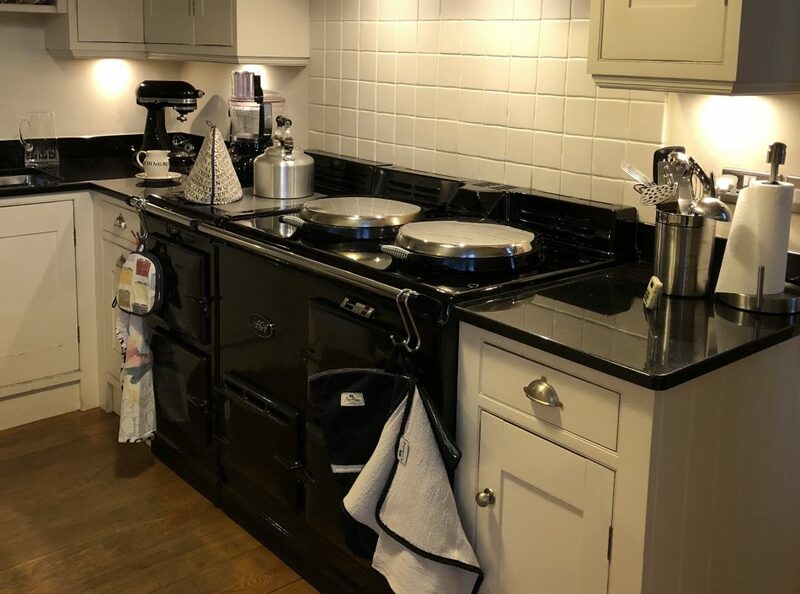 Mind you, that’ll teach me to think smugly that I might write a blog in which I pass on cooking tips and recipes to fellow Aga owners. Rest assured though, I will not rest until the mystery is solved and I WILL be having another go at this one. Apart from the middle, which I scooped into the bin, the cake was absolutely fine, so when my son came home from school, I put the kettle on and we laughed at my mishap. Oh, and ate some cake. What it’s supposed to look like. …turn it over and it’s not even cooked!